Offer in Polish English and German language. Oferujemy Państwu wypoczynek w nowym luksusowym Apartamencie w Rezydencji Stella Baltic przy ul. Orzeszkowej w Świnoujściu. Apartament znajduje się na 2 piętrze, budynek z windą. 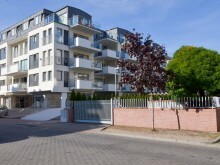 Apartament dwupokojowy, przeznaczony dla 4 osób, 41m2. Salon połączonym z aneksem kuchennym, z łazienka, sypialnia, oraz duży taras 12m2. Budynek położony 50m od nowej części promenady, 200m od plaży. Wysoki standard, kompleksowe wyposażenie oraz bliskość morza i promenady zapewnia Państwu udany wypoczynek. Doba za Apartament w sezonie w okresie wysokim 15.06-31.08 w cenie 350 zł. We offer you a rest in a new luxurious apartment in the Stella Baltic Residence at ul. Orzeszkowa in Świnoujście. The apartment is located on the 2nd floor, building with elevator. A two - room apartment, suitable for 4 people, 41 sq m. Living room combined with a kitchenette, with bathroom, bedroom, and a large terrace of 12m2. The building is located 50m from the new part of the promenade, 200m from the beach. High standard, comprehensive equipment and the proximity of the sea and the promenade will ensure you a good rest. In addition to its unquestionable spa values, Świnoujście has one of the most beautiful beaches, which extends to a distance of 10 km reaching in some places up to 130 m in width. In summer, the Baltic Sea near Świnoujście is the warmest of all seaside beaches in Poland. Doba for the Apartment in high season, 15.06-31.08 in the price of 350 PLN. Wir bieten Ihnen eine luxuriöse Wohnung in der Stella Baltic Residence in der Ul. Orzeszkowa in Swinoujscie. Die Wohnung befindet sich um 2 Stock, Gebäude mit Aufzug. Eine Zwei - Zimmer - Wohnung, geeignet für 4 Personen, 41 qm Wohnzimmer mit einer Küchenzeile, Schlafzimmer und eine große Terrasse von 12m2 kombiniert. Das Gebäude befindet sich 50 m vom neuen Teil der Promenade, 200 m vom Strand entfernt. Hoher Standard, umfassende Ausstattung und die Nähe der Promenade sorgen für eine gute Erholung. Swinoujscie hat neben seinen unbestrittenen Spa - Werten einen der schönsten Strände, der an einigen Stellen bis zu 130 m breit ist. Im Sommer ist die Ostsee in der Nähe von Swinoujscie die wärmste aller Strände in Polen. Doba für die Wohnung in der Hochsaison, 15.06-31.08 im Preis von 350 PLN.